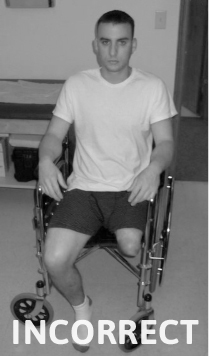 Positioning is extremely vital to help prevent contractures that can cause problems when fitting a prosthesis. If you are going to be sitting in a wheelchair you should always sit up straight, keep equal weight on both hips and try not to slouch. Avoiding any prolonged periods of sitting is best if possible. If you sit with your hips bent (flexed) for a long period of time, the limb may develop a contracture and prolong the necessary therapy. This will negatively effect your rehabilitation. Contractures can cause you to be uncomfortable in your prosthesis and/or effect how well you are able to walk. If a severe enough contracture occurs, this will limit your prosthetic options and candidacy. Proper positioning can be achieved with the use of a pillow while lying face down in bed. If you are lying on your back, avoid placing any pillows under your limb. One simple position that can greatly increase flexibility is to lay on your stomach and stretch the limb backward. When lying in bed remember to keep your legs together and try to avoid any type of rotation. Keeping these strategies in mind can help prevent unwanted contractures.